If you recall, I left off with the last post with a cross-threaded power steering hose. Sorting it out would take a few phone calls and a lot of hope. First thing I needed to do was find a tap to correct the threads I managed to mangle. There are LOTS of types of taps. And there are lots of names for those taps. It seems everyone has their own name for each type of tap. I’m sure it varies by region too. I did not know that before this project. I also did not know the name of the tap I needed. JagGuy told me I might need a bottoming tap. Bottoming tap: 1-2 lead threads ground. Used for continuing to thread a blind hole close to the bottom of the hole. It’s difficult to start threading a hole with this tap. Looking at the taps its easy to see the bottoming plug was best. Why? Well that is a good question. There are only 5 or 6 threads in the hole. 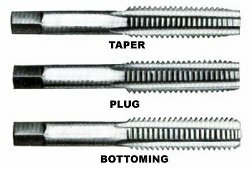 If you use a taper tap you might not have enough threads make contact. Same issue with a plug tap. I needed the bottoming tap. In any event I took the “test fitting” with me and we matched it up to a tap. I was shocked they had it, but they did. I was so stoked or chuffed or happy, maybe all three at once. This tool saved me several hundred dollars American in replacing the steering box. Having NEVER successfully tapped anything in my life…I chose to call JagGuy and ask for some sage advice. he was full of all kinds of advice for this. First bit of advice, pull the steering box. It turns out I probably would have been able to tap it in place. But, pulling it made it easier and I was able to clean it up while it was out. Second bit of advice, keep the shavings out of the unit. To do this he suggested dipping the tap in grease. The grease captures the shavings and you just have to wipe it off to eliminate the shavings. This was easy enough. With the advice in mind, I lined up the tap, and started it and gave it a turn. I backed it out and turned it again, like I had seen on countless TV shows. I turned it all the way to the stop and backed it out. I took the sample fitting and screwed it in. 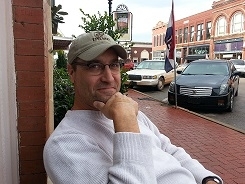 My awesome neighbor Mr. Fisher had walked over and was witness to the successful tapping. I have never been so excited. This was really awesome. I took the new hose and threaded that as well. I was convinced now that it would not leak and I was ready to clean it up and give it a coat of paint. Following my habit of painting everything I pull off the Range Rover and replace I gave the steering bits a couple of coats of primer gray. I managed to get her all together. I filled her with power steering fluid. I turned the steering wheel to the bump stops in each direction three or four times to clear out all the bubbles. I saw that on the TV as well, in fact Mr. Edd China from television show “Wheeler Dealer“ showed me that. Okay, now that the steering box is all back together. Where am I on all this? As it turns out the steering box probably has some damage from running with low fluid. There are “spots” when I turn the wheel where I get some negative feedback from the steering. It is either this or an in accurately aligned steering shaft. The shaft has two universal joints and if you don’t have it “just right” it binds a bit. I might be having this. To sort this out I will have to get back under the hood and see if I can adjust the bind out. On the OkieRover Difficulty Scale, this job is a three. I say three because the job is actually removing the steering box. So if you are going to swap your steering box this is a difficult job and there are lots of things to get back in place correctly. This entry was posted in Difficulty Scale, new tools, power steering, steering leak, steering shaft, Wheeler Dealers. Bookmark the permalink.